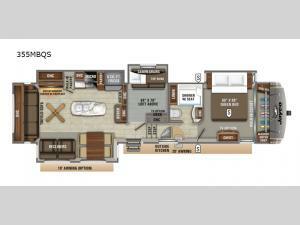 You won't believe the amount of space that four slides add to the interior of this Eagle fifth wheel! The kids will love spending rainy afternoons on the gamer chairs in the private bunkhouse, and the 64" x 76" loft will let anyone escape the chaos for a quick nap before heading out to more adventures. You will also be thoroughly impressed with the exterior portion of this fifth wheel because it includes an outside kitchen with the "Industry's Best" features, like a hybrid grill, USB ports, and specialty lighting, and the exterior marine-grade speakers will give you a chance to listen to your favorite broadcasts while you cook. You will also be kept cool and dry as you prepare dinner because the 20' electric awning with LED lights will protect you from the sun and rain.